Your junior will look and feel like a pro out on the links in these ultra-stylish FootJoy Stretch Lisle golf shirts. These FootJoy golf shirts are designed with a 3-button placket and a bold chest stripe across the front that provides a sharp, classic look that's appropriate for the golf course, school or any occasion! Solid design - with an athletic chest stripe. Easy care fabric - avoids wrinkling and shrinkage for consistent fit wash after wash.
ProDry fabrication - exclusive fabrication provides superior moisture control that quickly wicks away moisture, keeping your junior dry and comfortable all day. Anti-Microbial finish - eliminates odor and keeps your junior pro feeling so fresh and so clean before, during and after his golf rounds. 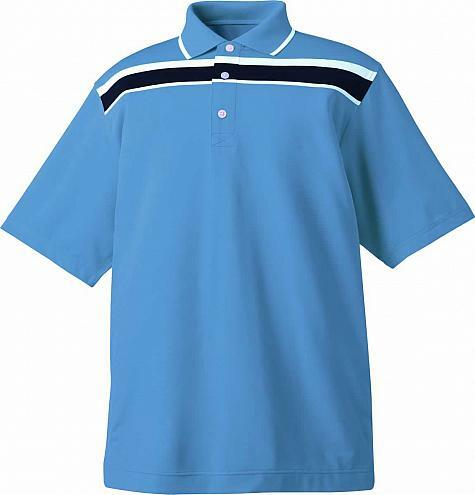 Double stitched seams - offer added durability, so that you know your junior's golf shirt can handle the stress of any activity - on or off the golf course.